The story of Shifting Gears begins in 2001when Larry Krantz and I decided to get married. As we set up our household on the 25 acres he owned north of town he told me he wanted to build a shed on the property to house his tractor, truck, and other equipment needed to manage our woodland. That seemed OK to me until he told me it would be 30 x 52 feet! “That’s not a shed, that’s a warehouse!” was my reaction, a perspective not shared by my future husband who was raised on a farm. “You’ve always wanted a place to work on your bikes,” he offered, “I’ll build you a shop in the corner. We’ll heat it so you can work year round.” That got me. Cycling has always been my passion and I’d never had the time or the opportunity to learn to work on my own bikes. True to his word the shop was built, simple, functional, and well insulated with a large pegboard for the tools I began to accumulate from EBay and Bike Tools Etc. Tinkering with my bikes and the bikes of friends, reading books, and the discovery Sheldon Brown’s website hooked me into the hobby of bicycle mechanics. My project the first winter was to overhaul a bike for my friend Joan Jasien. 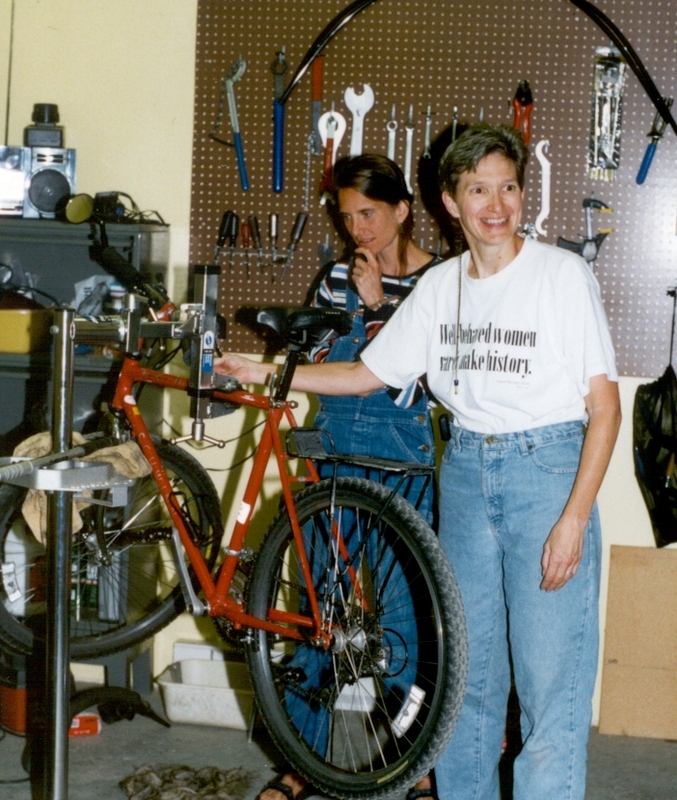 She was a student at the time and commuted everywhere on her classic Schwinn mountain bike from the 1980s, Cinnamon. I can still remember the feeling of elation as one winter evening I opened the headset and bottom bracket for the first time, revealing the elegant secret of ball bearings, cups, and cones that make the grace and speed of bicycles possible. This was quickly followed by despair at ever getting poor Cinnamon back together again. Thanks to persistence, dozens of stupid but educational mistakes, and the generous, patient advice of the folks at The Home Place she was back on the road in the spring and served Joan well for years of 4 season commuting until she was stolen a few years ago. Diane, Joan, and Cinnamon. What did I get myself in for? Way to keep to your resolution, Diane! The history, the blog–it all looks great and really creates a feeling of the evolution and potential of Shifting Gears. It’ll be a great way to keep in touch with you and your passion. . . Very nice, Diane! Love the photos of Mark and Bjorn working on the bikes. I have a photo of the winner of the boy’s bike, but the girl’s photo didn’t turn out. We sure need lots of help for this year’s rodeo! Great blog and pictures , Diane. (Especially the ones of the Tuscon desert). Thanks for sharing your stories. Go Shifting Gears!